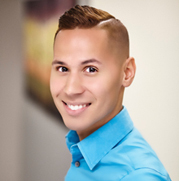 Chris, a Psychology Graduate from Worcester State University, came to Osorio Dental group with years of experience and knowledge in the health field. Dedicated, compassionate, and service- focused, Chris prides himself on his polite and well-mannered demeanor, which builds strong rapport with colleagues, patients, and providers. He is passionate about helping others and is always eager to learn new concepts and skills. In his free time Chris enjoys listening to and discovering new music, and updating his own music blog which garners an audience and views from all over different parts of the world. He also loves spending quality time with his loved ones, any outdoor activity related to warm weather, dancing, movies, and making others smile.